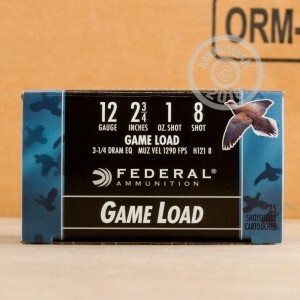 Federal game loads deliver excellent performance for small game hunting and clay shooting. 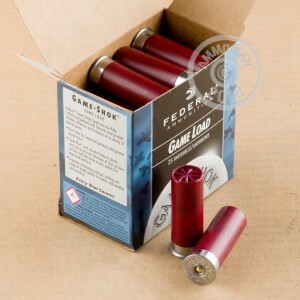 These 12 gauge shells come in an economical case of 250 and fire an ounce of #8 lead shot at a relatively high muzzle velocity of 1,290 feet per second. Expect good patterns and reasonable levels of recoil. This ammunition is loaded in Anoka, Minnesota at Federal's longtime headquarters and main production facility. Grab a couple of these cases (or anything that gets your order total over $99) to earn massive bulk savings from AmmoMan.com!